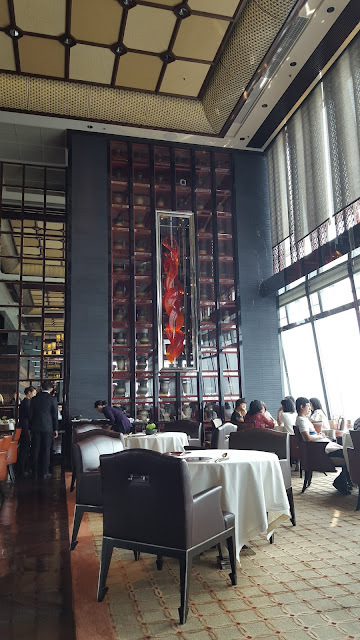 To celebrate K's birthday, which occurred during our trip, I treated him to lunch at Tin Lung Heen, a two Michelin-starred restaurant in the Ritz-Carlton Hong Kong, a hotel which occupies the top several floors of the International Commerce Center (ICC) in Kowloon, Hong Kong. 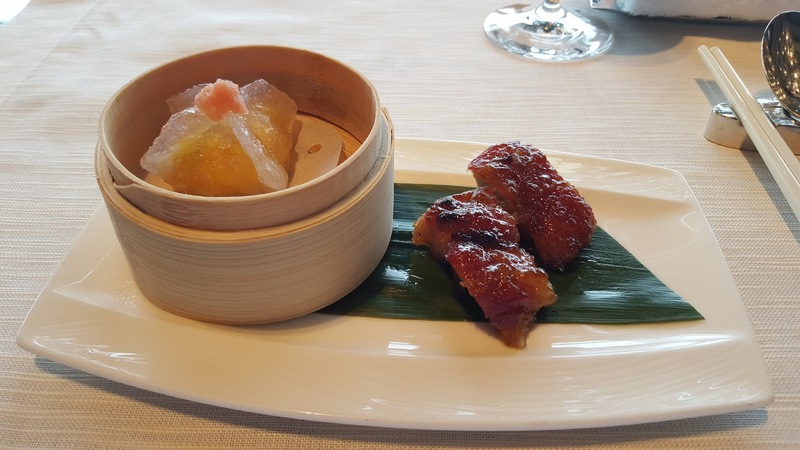 There are several one, two, and three Michelin-starred Chinese restaurants in the same general mold as Tin Lung Heen. 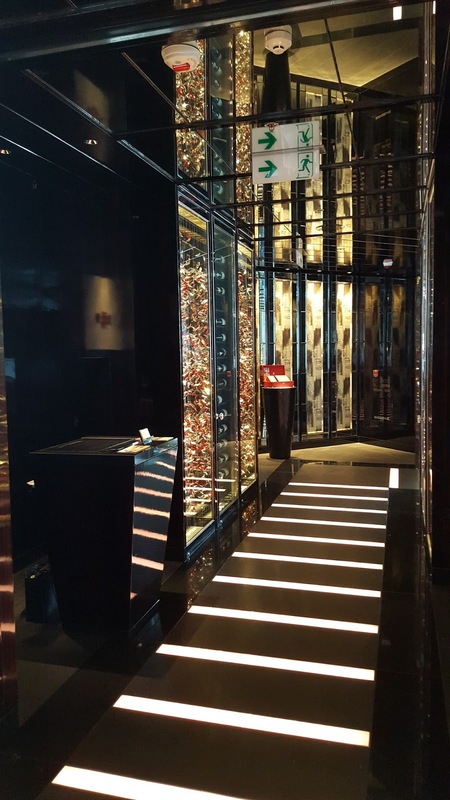 They all seem to serve a largely Cantonese-style menu (naturally, given the location), seem to be priced about the same (read: very expensive), and are all located in fancy hotels. It was an experience I couldn't justify paying for in the earlier times when I worked or interned in HK, and it is still something that I wouldn't necessarily pick out just for myself because, well, fine dining for one is a possibly strange notion. Either way, I wanted to treat K to this type of special food experience while we were in HK. I made my reservation for our weekday lunch about ten days early, though as far as I could tell from the size of the crowd, a day or two in advance is probably fine for weekdays. Getting a window table would require reserving earlier or, possibly, being a guest at the Ritz-Carlton, and I wasn't able to get one. 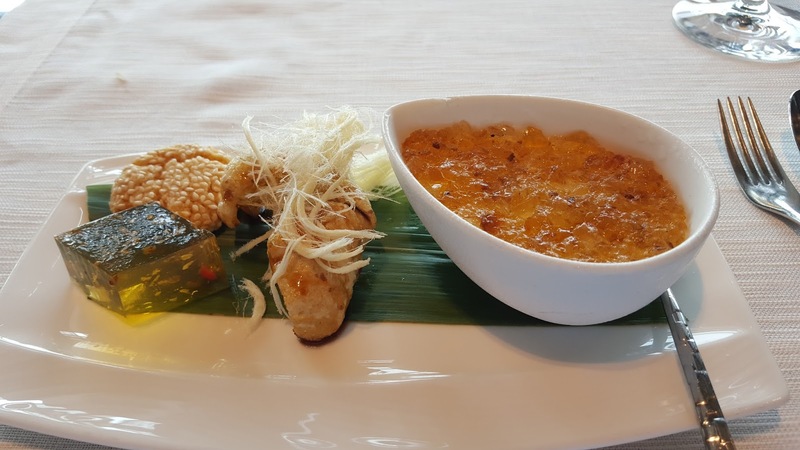 Reviews for both Tin Lung Heen and the Ritz-Carlton's bar, Ozone, suggest that both are too high up to actually get a particularly good view, especially after the generally hazy summer weather is taken into account. We had the executive set lunch, which was 598 HKD/person before 10% service charge and additional surcharge for tea, and came with either a glass of wine or juice. It includes five courses, each with two dishes except for the soup course, and it also includes a dessert course. Behind the cut, I've included photos of each of our dishes. I think this was the first course, which included a crab roe dumpling and some cha siu made with Iberico pork. The roast pork was, without a doubt, the fanciest take on the dish that I've ever had, and it certainly tasted good, as did the dumpling. I'm fairly sure that soup was the second course. 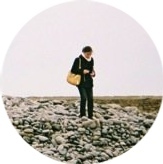 If not, then this was first and the dumplings were second. 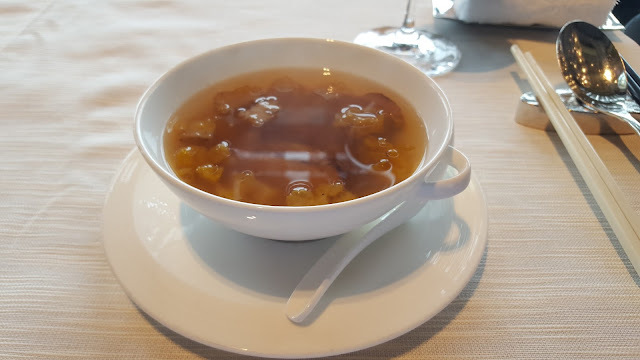 I'm a fan of Cantonese-style double-boiled soup generally, and I wish I knew how to make it, or something similar, at home. 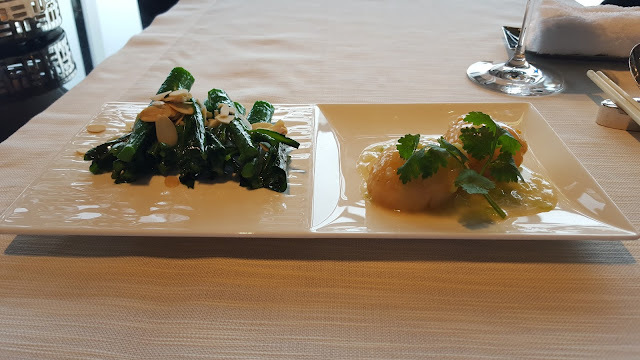 The third course was a scallop dish at the right and a sauteed choi sum dish on the left. Both were delicious. By the end of this course, both K and I were quite full. 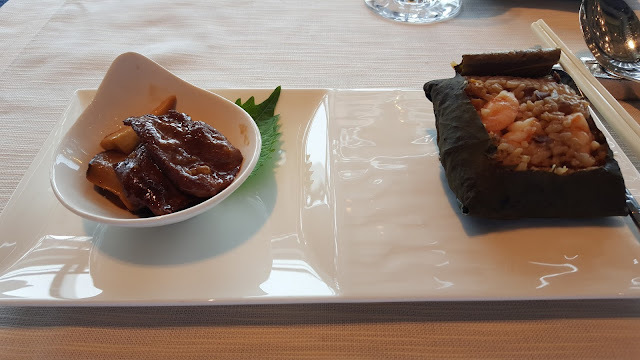 The fourth course included the sautéed pigeon and mushroom dish on the left and a sticky rice dish on the right. By now, I was completely full, so I barely made any headway on the rice, though I did finish the dish on the left. The dessert course was nice, though I was definitely too stuffed to enjoy much of it. There was a milk pudding topped with some kind of jelly on the right, a fried cookie topped with dragon's beard candy in the middle, and the free petit fours on the left. The petit fours are a diamond of osmanthus jelly (a dish I haven't seen in the US) and an almond cookie.